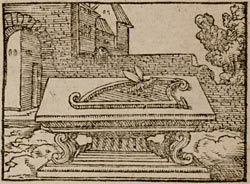 French Emblems: Emblem: La musique plaist aux Dieux. La musique plaist aux Dieux. Contre Ariston, rompit sa corde. Qu’Eunome en obtint la victoire. L’offrant à Phebus, pour memoire. 1. This is a translation of Anthologia graeca 6.54. See Strabo, Geography 6.1.9 for the story of Eunomus and the statue he set up at his home town of Locri commemorating this incident in the song contest at the Pythian Games (celebrated near Delphi, in honour of Apollo, Artemis and their mother Leto); also Erasmus, Adagia 414, Acanthia Cicada.